The Virgin Group signed an “intent agreement” with Maharashtra government to build a hyperloop transportation system between Navi Mumbai International Airport and Pune. 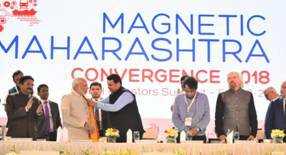 Announcement about the framework agreement was made by Virgin Group Founder and Virgin Hyperloop One chairman Sir Richard Branson at Magnetic Maharashtra event in the presence of Prime Minister Narendra Modi and Maharashtra Chief Minister Devendra Fadnavis. The Hyperloop, a fully electrical system with a capacity to travel at a speed of 1,000 km per hour, aims to reduce the travel time between the two mega cities to 25 minutes from the three hours at present. The foundation stone was laid by Prime Minister Narendra Modi. 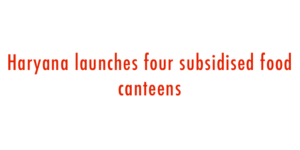 The Haryana government launched four canteens which will serve subsidised and healthy food to the poor. Haryana Chief Minister Manohar Lal Khattar launched the food canteens at Faridabad, Gurugram, Hisar, and Yamunanagar via videoconferencing from Chandigarh. The canteens have been set up under the ‘Antyodaya Aahaar Yojana’ to provide healthy, nutritious and hygienic food at only Rs 10 per meal to all poor and needy. The Haryana government is implementing a special project of Rs 435.23 crore in 36 over exploited and critical blocks in 13 districts to encourage micro irrigation and recharge ground water in the state said by Principal Secretary, Agriculture and Farmers Welfare Department, Dr Abhilaksh Likhi and the Canal Area Development Authority were being implemented under the project. Maharashtra government is all set to roll out its “Asmita Yojana” on the International Women’s Day next month. Under the scheme, girls in Zilla Parishad schools will get a sanitary napkin packet at Rs 5 while rural women can avail it at a subsidised rate of Rs 24 and Rs 29. 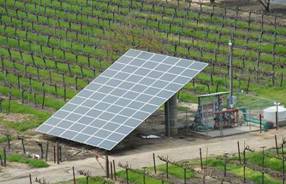 “Umed’- the Maharashtra State Rural Livelihood Mission will be the nodal agency for implementation of this scheme. Under the scheme, beneficiary girls will be given “Asmita Cards”, while participating Self Help Groups (SHGs) will be entrusted with the task of the supply and sale of sanitary pads and counselling the girls and women. 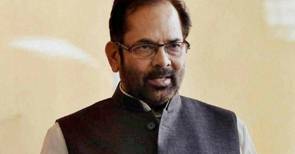 Union minister Mukhtar Abbas Naqvi said that an International Educational Institution for Minorities will be built in Rajasthans Alwar city as part of the Centres ambitious plan to set up five such institutes across the country. The plan for building these institutes was initially prepared in 2016 and an 11-member committee was formed under former bureaucrat Afzal Amanullah to oversee it. 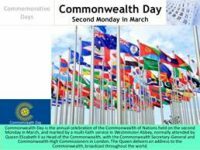 The committee submitted its report to the Minority Affairs Ministry and after March 2017 the work on this ambitious project started, he said. Government is also considering having 40 per cent reservation for girls at these institutes. Atal Bhujal Yojana (ABY), the scheme will be launched in Gujarat, Maharashtra, Haryana, Karnataka, Rajasthan, Uttar Pradesh and Madhya Pradesh, covering 78 districts, 193 blocks and more than 8,300 gram panchayats. According to a World Bank report, about 245 billion cubic metre of groundwater is abstracted each year in the country. This figure represents about 25% of the total global groundwater abstraction. Women in Saudi Arabia can now open their own businesses without the consent of a husband or male relative, as the kingdom pushes to expand a fast-growing private sector. This policy change by Saudi Arabia government is seen as a move towards expansion of private sector and women employment. Private sector lender, Axis Bank announced opening of off-shore banking unit at the International Financial Services Centre (IFSC) at Gujarat International Finance Tec-City (GIFT City). With opening of this unit, Axis Bank will be able to provide a more comprehensive range of products to its customers with access to International financial markets. Axis Bank’s off-shore banking branch at IFSC was inaugurated by Union Commerce Secretary, Rita Teaotia in presence of Shikha Sharma, MD & CEO, Axis Bank. The offshore Banking unit is capable to trade in foreign currency in overseas markets and also with Indian Banks, raise funds in foreign currency in deposits & borrowings from non-residential sources and provide loans and liabilities products for clients. Amazon has rolled out its own food retailing business in India with a pilot in Pune, becoming the first foreign ecommerce firm to stock and sell food items directly to consumers. 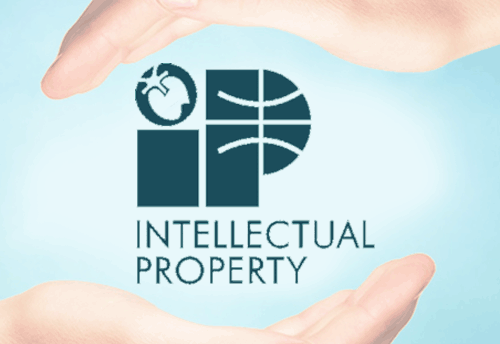 From June 2016, Indian Government allowed 100% Foreign Direct Investment (FDI) in food retailing, permitting foreign firms to sell locally sourced and packaged food items directly to consumers. International Finance Corporation (IFC), member of the World Bank Group, is set to enter into a pact with PNB Housing Finance to form an $800-million platform to support construction of environment-friendly affordable houses across the country. IFC is helping mobilise over $1.6 billion for affordable housing segment in less than 10 months. According to the alliance with PNB Housing Finance, IFC will make $400 million available for the new facility, of which $150 million will be its own money and the rest will be mobilised from other sources. Vice Admiral R B Pandit, Flag-Officer-Commanding, Western Fleet at Mumbai, took over as the Commandant of Indian Naval Academy (INA) at Ezhimala in nearby Kannur district. 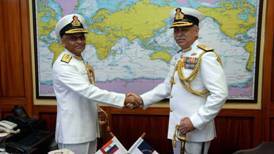 He replaces Vice Admiral S V Bhokare. Roger Federer marked his impending return to the top of the world rankings by sweeping aside second seed Grigor Dimitrov in the Rotterdam Open final in Netherlands. This is the 97th title in his overall career. In this count, he is only behind America’s Jimmy Connors who has won 109 titles. Bhuvneshwar Kumar, a fast bowler, has become the first Indian bowler to take a five-wicket haul in all three formats in International Cricket. 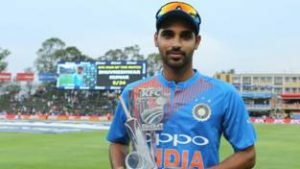 Bhuvneshwar Kumar made this record by taking his first T20I five-wicket haul at the first T20I against South Africa at the Wanderers Stadium, Johannesburg. 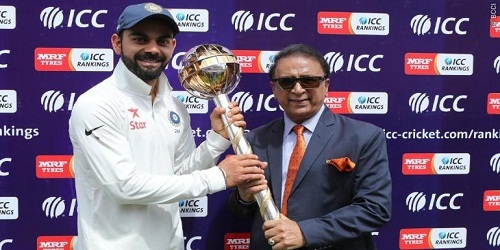 Bhuvneshwar Kumar was awarded the Man-of-the-Match Award. He has also become the second Indian to take a five-wicket haul in T20Is after Yuzvendra Chahal. French jazz violinist Didier Lockwood, whose eclectic career spanned more than four decades and the world’s most prestigious festivals and concert halls, has died. He was 62. Well-known Telugu cinema comedian Gundu Hanumantha Rao passed away in Hyderabad. He was 61. The first role he essayed on stage was in a play called Ravana Brahma in Vijayawada. He has won three Nandi awards. 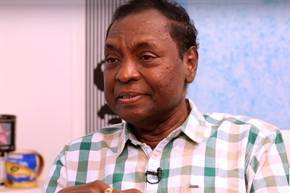 Telugu actor Gundu Hanumantha Rao passes away.